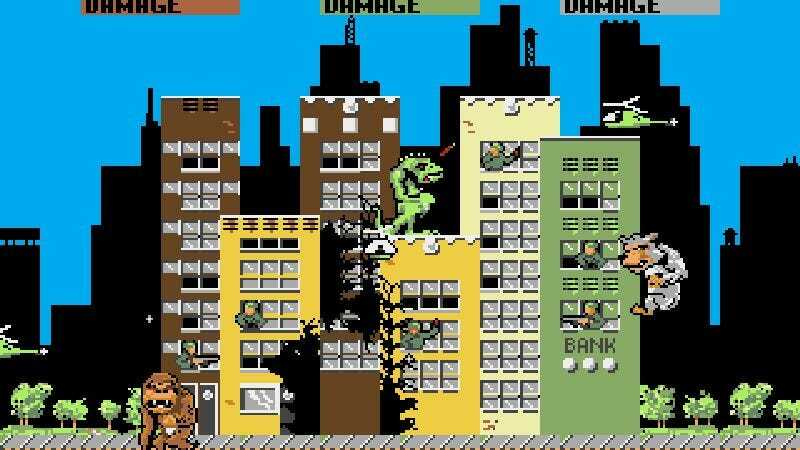 Not to be confused with the Uwe Boll vigilante movie from 2009, Rampage is an ’80s arcade game where players, in the guise of either George (an off-brand King Kong), Lizzie (an off-brand Godzilla), or Ralph (a, um, giant werewolf) compete to destroy a major American city. As the game goes on, the cities get less major, the obstacles get more difficult, and players learn to empathize with the creatures, asking themselves if perhaps the real monsters here are the tiny pixelated men shooting at them in tiny pixelated tanks. It’s practically plotless and really fun, meaning that it might make a decent Dwayne “The Rock” Johnson movie. And that’s exactly what’s happening, as the only man who could make us love a Big Trouble In Little China remake has signed on to star in a big-screen version of Rampage. Unfortunately, Johnson will not be playing one of the monsters, but a typically “formidable” character who “gets in their way.” Non-Stop writer Ryan Engle will pen the script, and New Line Cinema is currently looking for a director who can smell what Johnson is cooking. Johnson, who, as usual, is currently attached to about a million projects, is reportedly prioritizing (i.e., getting paid handsomely for) the film, and will shoot it as soon as he finishes shooting Furious 8.